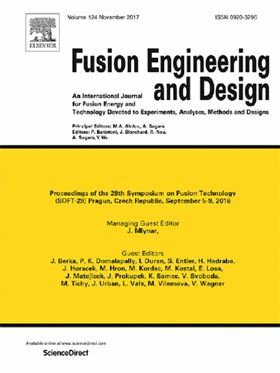 The research paper 'Mercury ring pump proof-of-principle testing in the THESEUS facility' has been published in Elsevier journal Fusion Engineering and Design. For the DEMO torus vacuum system, liquid ring pumps (LRPs) with mercury as working fluid have been proposed. These vacuum pumps shall be used for pumping the torus down to a pressure <100 Pa and for providing rough vacuum for the torus primary pumps. Unfortunately, liquid ring pumps operated with mercury have never been built and tested before, so no operational experience is available. It is not even clear if the pump will work with such a high density working fluid or if the pump can withstand the high mechanical forces. Therefore, proof-of-principle-testing has become necessary. This is the very first step in the development of a DEMO relevant LRP that is hermetically tight and fully tritium compatible. The paper describes the proof-of-principle experiments that have been performed in the THESEUS pump test facility at KIT and its results. Special focus of the paper is given to operational aspects as well as to mercury handling procedures. The impact of these findings on the design of future LRPs in a DEMO relevant design is shown up and modifications of the existing design are proposed. The research paper 'An electromagnetically actuated high frequency oscillation pump' has been published in Elsevier journal Mechatronics. 'Research and current status of the solar photovoltaic water pumping system – A review' has been published in Renewable & Sustainable Energy Reviews. 'Noise source identification and transmission path optimisation for noise reduction of an axial piston pump' published in Applied Acoustics journal.